The Rajasthan Domestic Travel Mart 2018 (RDTM 2018) held in Jaipur, India, from July 20 to 22 was a clear landmark event in the hosting of such shows, and its success was seen at many different levels. Organized by the Federation of Hospitality and Tourism of Rajasthan (FHTR) with the support of stakeholders, the event attracted sellers and buyers who were keen to make the best of the unique opportunity, which is sure to be emulated by other India States. While Rajasthan has traditionally been a major attraction for both domestic and international tourists, in recent years, some other States like Kerala and Madhya Pradesh have been getting more attention, and this trend will hopefully be reversed by the RDTM2018. Interestingly, Lalit Panwar, Vice Chancellor of the state Skill Development University, and a former Secretary in the ministry, in his address, noted that human resource development was a missing link and more attention to it will make all the difference. Training manpower with stakeholders and for the industry was a major task for the university, he said. FHTR President Bhim Singh said an increase in tourism would mean more jobs and higher GDP. 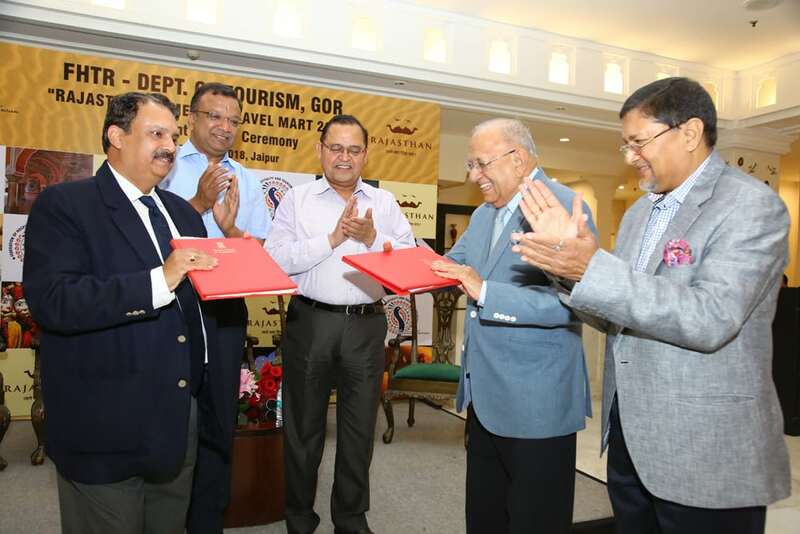 Suman Billa, Joint Secretary, Minister of Tourism, noted that the growth in domestic tourism has been very impressive, while Kuldeep Ranka, Principal Tourism Secretary, Rajasthan, said air connectivity to different cities in the State has gone up, adding to the higher number of domestic tourists. Tier 2 and Tier 3 cities have seen a significant rise in visitors. The sellers at the mart included many heritage properties, even in smaller towns, and buyers came from many cities, keen to know the new and old attractions and facilities in the princely, Maharaja State. Among the areas represented at the mart were Bundi, Hadoti, Jhalawar, Karauli, Kumbalgarh, and Sambhar. Wildlife destinations also got attention, as did the popular Palace on Wheels, which has seen impressive advance bookings, and was also there, led by General Manager Pradepp Bohra. The Sambhar Heritage Resort and the upcoming Perwa Leopard Den in Pali were also being promoted. The Sonaar Haveli in Jaisalmer was also in the limelight, as were the Suryagarh and the Fern. Several marketing setups were there to promote off-beat and lesser-known destinations and accommodations. Among them was Ms. Shruti Pandey of Synergi Hospitality Marketing who said that she has gotten some leads at the RDTM to follow. Some of the pillars of the mart were Bhim Singh, Gyan Prakash, Mohan Singh, and Vikram Singh. The HRH Group of Udaipur also had a strong presence. The sellers and buyers with whom this correspondent spoke with lauded the effort and initiative and hoped that in the years to come, the mart will become even more popular and relevant.